4 years of intensive research it took, before we arrived at the location we had been looking for all those years. 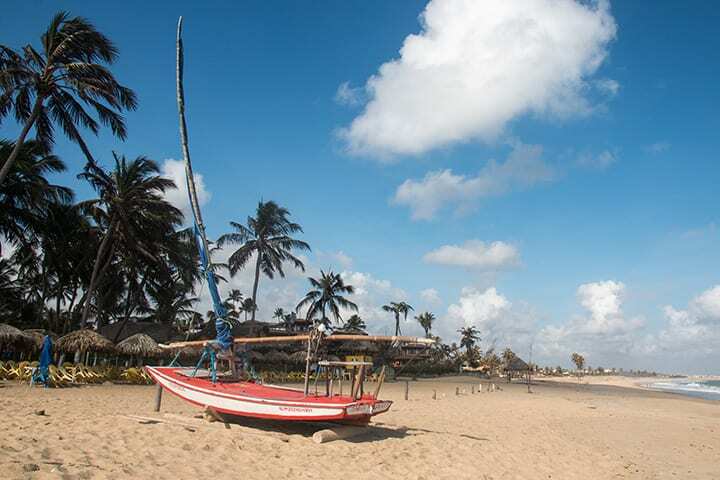 After travelling around, mainly in the Caribbean, in search for the perfect kitesurf place to start a kitesurf hotel, we arrived in Cumbuco, Brazil. Here we found the perfect spot. It was 2004 and kitesurfing was just an upcoming sport, but the potential was there to grow and so did Cumbuco have the potential to became the kitesurf number one spot in the world. Perfect conditions, weather, logistics, etc. Close to a big city, international airport, lagoons,… you name it, everything is there. Also the development potential was huge. So we choose the best spot in Cumbuco and bought a piece of beachfront land in order to build up our dream. We’re right at the kitesurf beach, just downwind from Cumbuco center and upwind from the main lagoon. From Cumbuco center we are close enough to walk, and far enough to be in our private quiet area. Also from Fortaleza we’re not too far away. In a 45 minute drive you’ll arrive in this buzzling big city, while Cumbuco offers you tranquillity. In both cases we’re ‘close enough to thrill, and far enough to chill’.